Ever wonder how cat vaccines can protect your pet's health from a variety of common diseases? Learn how vaccines work, as well as which vaccines should be a priority for your cat and which vaccines can be administered as needed. Vaccines stimulate your pet's immune system by delivering a minute, weakened or killed dose of an actual disease in order to prompt the creation of antibodies to attack and defeat the intruder before it can overwhelm your pet's body. Cells in your pet's bloodstream retain the memory of which antibodies were successful against a particular organism, and immediately produce more each time your pet is re-exposed to the pathogen. Most kittens will receive a series of three to four vaccinations beginning around the age of six weeks, which is about the time they wean and quit receiving immunities from their mother's milk. These boosters will provide each kitten with enough temporary immunities until its system is mature enough to sustain that immunity for at least a one year period. Once a cat reaches one year of age, he will likely receive a yearly booster for the rest of his life, unless your veterinarian recommends otherwise. 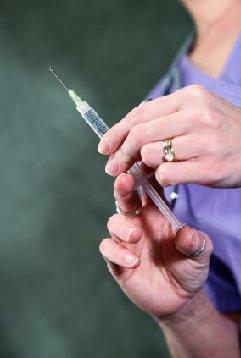 According to Christianne Schelling, DVM, the following vaccines are the most necessary. Feline Viral Rhinotracheitis - This is a highly contagious upper respiratory tract infection that causes fever, coughing, sneezing and eye discharge. Calicivirus - This is another highly infectious respiratory infection that is contracted through direct contact with infected cats and their feeding bowls and bedding. Panleukopenia - This is a potentially deadly feline virus that is comparable to Parvo in dogs. Common symptoms include vomiting, diarrhea, dehydration, and extreme lethargy. Rabies - The rabies virus must also be guarded against with a vaccination received every one to three years according to your local laws. This deadly virus attacks the central nervous system, causing bizarre behavioral changes, foaming at the mouth, general stupor and partial paralysis. It is passed through direct contact with bodily fluids and remains active for a time even after death. Other individual cat vaccines are administered on an "as needed" basis, determined by your veterinarian. Pneumonitis: This is an inflammatory infection of the lungs that can progress into pneumonia. FeLV: Feline Leukemia is an incurable viral infection contracted through exposure to infected bodily fluids such as urine, saliva, tears and mother's milk. The virus acts as an immuno suppressant that causes cancer. FIV: Feline AIDS is similar to the human AIDS virus. It suppresses the immune system, and leads to a variety of infections and illness. This vaccine is not indicated for every cat. House cats that have limited exposure with other pets are not considered at high risk for the disease. Cats who do receive the vaccine will test positive for FIV in the future. FIP: Feline Infectious Peritonitis is a contagious virus that comes in two forms. The wet variety causes fluid to build up in your cat's abdomen, while the dry variety causes eye lesions, anorexia and dehydration. The disease is almost always fatal. Your vet will determine which cat vaccines your pet needs and when based on his age, health and lifestyle. The following table provides a schedule for basic vaccinations, but it shouldn't be considered an absolute rule. It's fairly rare, but in some incidences cancerous tumors will form at the vaccination site. Since the common vaccination site is in the scruff of the neck, tumor removal is complicated by the presence of so much muscle and bone tissue. Many vets now elect to give cat vaccines in the hip area, so that if a tumor does develop, there is more room to work around it. The thought of your pet developing cancer from a cat vaccine is admittedly alarming, but in reality it is not likely to happen. Your cat has a far greater chance of contracting one of the other listed diseases, so opting to avoid vaccinations might not be a sound decision. There are some risks that go along with the practice. Vaccination sarcomas have already been addressed, and a small number of cats actually contract a case of a particular disease when modified live viruses are used and the cat's immune system fails to adequately respond. Although these are both possibilities, the incident rate is not high enough to justify foregoing cat vaccines altogether. There is, however, a good case for giving cat vaccines singularly, rather than in combination shots. A combo is sometimes simply too much for a cat's system to handle all at once, especially for senior cats and cats with chronic illnesses such as diabetes and kidney disease. For such pets, a single type of vaccine can be administered one dose at a time, with sufficient time allowed in between for your cat's system to adjust. Overall, cat vaccines are highly beneficial for your pet, preventing him from contracting a number of deadly and terrible diseases. Although there are some risks involved, they are minimal compared to the protection each booster provides. Let your vet be your guide to exactly when and which vaccinations your pet should receive.